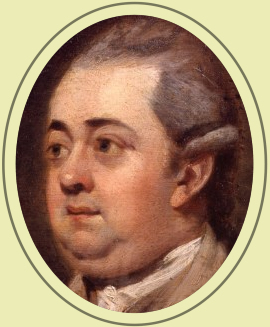 Edward Gibbon (1737-94) was born into an old and moderately wealthy family that had its origins in Kent. Sickly as a child, he was educated at home, and sent while still a boy to Oxford. There, an illegal conversion to Roman Catholicism ruined his prospects of a career in the professions or the City. His father sent him off to Lausanne to be reconverted to the Protestant Faith. He came back an atheist and with the beginnings of what would become a stock of immense erudition. He served part of the Seven Years War in the Hampshire Militia. He sat in the House of Commons through much of the American War. He made no speeches, and invariably supported the Government. He moved for a while in polite society – though his increasing obesity, and the rupture that caused his scrotum to swell to the size of a football, made him an object of mild ridicule. Eventually, he withdrew again to Switzerland, where obesity and his hydrocele were joined by heavy drinking. Scared by the French Revolution, he came back to England in 1794, where he died of blood-poisoning after an operation to drain his scrotum. When not eating and drinking, and putting on fine clothes, and talking about himself, he found time to become the greatest historian of his age, the greatest historian who ever wrote in English, one of the greatest of all English writers, and perhaps the only modern historian to rank with Herodotus and Thucydides and Tacitus. The first volume of his [amazon_textlink asin=’B01BU0P3CS’ text=’History of the Decline and Fall of the Roman Empire’ template=’ProductLink’ store=’seagab-21′ marketplace=’UK’ link_id=’e2bfcd49-a6ed-11e7-bddb-8d60d1b99041′] astonished everyone who knew him. The whole was received as an undisputed classic. The work has never been out of print during the past quarter-millennium. It remains, despite the increase in the number of our sources and our better understanding of them, the best – indeed, the essential – introduction to the history of the Roman Empire between about the death of Marcus Aurelius and the death of Justinian. This being said, where to begin with a review of the Decline and Fall? It is a vast work. It fills six closely-printed volumes in most editions. The kind of review it deserves starts with ten thousand words and has no upper limit. And so I will confine myself to a brief overview of what I like about Gibbon. So far, I have read the work three times from cover to cover. It has haunted my imagination since I came, as a boy, across an abridgement. It has shaped my writing style more than any other author, including even Macaulay. Its general influence lurks in the background of all my historical fiction. The debt is most obvious in [amazon_textlink asin=’1444709682′ text=’Sword of Damascus’ template=’ProductLink’ store=’seagab-21′ marketplace=’UK’ link_id=’0bcab2d5-a6ee-11e7-bb8b-8f6fe6b718d8′], which is shot through with echoes and near-quotations. I last read him in 2015, while working on [amazon_textlink asin=’1530780969′ text=’Game of Empires’ template=’ProductLink’ store=’seagab-21′ marketplace=’UK’ link_id=’f5c88b52-a6ed-11e7-92be-137c8ae2481e’]. I opened the first volume one Sunday afternoon in January, and closed the last volume early in March. During this time, almost every moment not reserved to earning a living or to the cares of married life was given up to reading Gibbon. I read him on railway trains and in the gaps between lessons. I read him in bed and once very furtively in the Church of St Mary le Bow. I read him sometimes with enthusiasm and sometimes with helpless envy. I read him sometimes with impatience. But always I read him in the knowledge that he was The Master. I cannot understand the belief, generally shared these past two centuries, that the golden age of English literature lay in the century before the Civil War. I accept the Prayer Bookand the English Bibleas works of genius that will be appreciated so long as our language survives. I admire the Essays of Francis Bacon and one or two lyrics. But I do not at all regard Shakespeare as a great writer. His plays are ill-organised, his style barbarous and tiresome. I fail to understand how pieces like A Midsummer Night’s Dream and Romeo and Juliet, with their long, ranting monologues, can be thought equal to the greatest products of the Athenian theatre. I grant that Julius Caesar is a fine play – but only because Shakespeare stayed close to his ancient sources for the plot, and wrote in an uncharacteristically plain style. Perhaps I am undeveloped in some critical faculty; and I know that people whose judgements I trust have thought better of him. But I cannot see Shakespeare as a great writer or his age as the greatest in our literature. For me, the golden age begins with Dryden and Congreve, and continues into the eighteenth century with Pope, Swift and Addison. It holds up until nearly the end of that century, after when there is a gentle decline towards the murkier style of the Victorians. The strengths of the Augustans were clarity and balance in their writing, and their general dislike of enthusiasm. In Gibbon, these virtues are carried about as far as they can go. Granted, his style is often feline. Granted, he generally insinuates his theological views where he dares not assert them. Granted, his footnotes are littered with the most comic vanity that any historian ever displayed; and his readers are always aware of M. Pomme de Terre wandering up and down his study in his club wig and coat, composing those matchless sentences, and every so often glancing lovingly up at the portrait of himself hung just above the fireplace. But what matchless sentences they are, and how devastating they can be in the cause of enlightenment and humanity. The rigid sentence of Omar is repugnant to the sound and orthodox precept of the Mahometan casuists; they expressly declare, that the religious books of the Jews and Christians, which are acquired by the right of war, should never be committed to the flames; and that the works of profane science, historians or poets, physicians or philosophers, may be lawfully applied to the use of the faithful. A more destructive zeal may perhaps be attributed to the first successors of Mahomet; yet in this instance, the conflagration would have speedily expired in the deficiency of materials. I should not recapitulate the disasters of the Alexandrian library, the involuntary flame that was kindled by Caesar in his own defence, or the mischievous bigotry of the Christians, who studied to destroy the monuments of idolatry. But if we gradually descend from the age of the Antonines to that of Theodosius, we shall learn from a chain of contemporary witnesses, that the royal palace and the temple of Serapis no longer contained the four, or the seven, hundred thousand volumes, which had been assembled by the curiosity and magnificence of the Ptolemies. Perhaps the church and seat of the patriarchs might be enriched with a repository of books; but if the ponderous mass of Arian and Monophysite controversy were indeed consumed in the public baths, a philosopher may allow, with a smile, that it was ultimately devoted to the benefit of mankind. I first read this passage in 1987, lying on my bed at about three in the morning. I nearly cried with laughter then, and I still laugh as I transcribe the sentence. One needs to know about the disputes over the nature of Christ that disgrace the Church between the reigns of Constantine and Justinian, to appreciate the full weight of Gibbon’s scorn; but the contrast between “library” and “repository of books”, between “patriarch” and “philosopher”, and the descent of time from the Antonines to Theodosius, tells us all that needs to be known of what he thought about Christianity. As said, this was not my first meeting with Gibbon. I was twelve when I found him in the abridgement by D.M. Low. As an undergraduate, I made use of him in the J.B. Bury edition up till the reign of Heraclius and the Arab conquests. In my middle twenties, I went through him again in a desultory manner, skipping chapters that did not interest me. But it was only as I approached thirty that I read him in the full and proper order, from the military resources of the Antonines to the revival of Rome under the Renaissance Popes. It is only by reading him in the whole, and by paying equal attention to text and footnotes, that he can be appreciated as a supreme historian. Much of his greatness is seen by considering the materials he had available for his History, and the use he made of them. Much entertaining history of Antiquity was written in the eighteenth century – see Voltaire and Montesquieu, to give the most notable writers. The Enlightenment historians were not poor scholars, and they are often still worth reading. At the same time, they often based their narratives on a slender foundation. The scholars of the previous century had provided much more sold foundations. They had gathered up and printed everything they could find. Of equal importance, they had established a sound chronology of events. Before they began their immense labours, no one had known, for example, whether Stesichorus and Pythagoras and Phalaris were contemporaries, or when the Attic dialect became the standard literary language of Greece. By 1700, educated men were able to know more in some respects about the Ancients than they themselves had known. But Tillemont and Mabillon were men of limited ambition. Their concern with establishing the facts never reached as far as discussing what these facts might show. They were pedants. Frequently, they were religious bigots. It was almost a point of honour among the enlightened to ignore the heavy mass of their learning. To write his History, Gibbon made full use of the seventeenth century scholars, and then of their sources. He judged everything and made further use of it in the full light of Economics and Anthropology and what we might as well call Sociology. He was, to use the terminology of his age, both érudit and philosophe. We see his achievement most strikingly, I think, in his account of the later fourth and the fifth century. To the Battle of Adrianople he has at least one first rate historian to follow. Then, Ammianus Marcellinus falls silent, and he must instead look for his leading facts in a mass of ecclesiastical notices, and law collections, and coin evidence. You see how he begins to press his sources for evidence near the beginning of Chapter XXVI. His notes grow longer and more diverse. You find no change of gear, though, in his main narrative. It goes smoothly on through chapter after chapter. It is like watching a motor car reach the end of a paved road and continue across country. You can see the frantic and irregular bouncing of the wheels – but the passengers feel nothing. They are aware that new territory has been entered, but, without paying close attention, can remain unaware of the sudden strain placed on the suspension or on the driver of the vehicle. Gibbon set new standards of historical scholarship, and remains, more than two centuries later, one of the masters of these standards. Even where he can be criticised for letting his prejudices cloud his judgement, Gibbon remains ultimately fair. He dislikes Christianity, and is convinced that it contributed to the decline of the Empire. His fifteenth and sixteenth chapters are one long sneer at the rise and progress of the Christian Faith. They excited a long and bitter controversy. There was talk for a while of a prosecution for blasphemy. But this was only talk. A man of Gibbon’s place in the social order was not to be taken into court like some hack writer with no connections. A candid but rational inquiry into the progress and establishment of Christianity may be considered as a very essential part of the history of the Roman empire. While that great body was invaded by open violence, or undermined by slow decay, a pure and humble religion gently insinuated itself into the minds of men, grew up in silence and obscurity, derived new vigour from opposition, and finally erected the triumphant banner of the Cross on the ruins of the Capitol. A fine and even pious opening – almost worthy of a true believer. He then continues through the next ten or twenty thousand words in a tone of inspired sarcasm. Never once does he let himself fall into open impiety. But what he really thinks comes through like water through a bed of gravel. It is a matter of how he balances his sentences, and of hesitations and implied doubts. Jerome, in his Legend of Paul the Hermit, tells a strange story of a young man, who was chained naked on a bed of flowers, and assaulted by a beautiful and wanton courtesan. He quelled the rising temptation by biting off his tongue. If the decline of the Roman empire was hastened by the conversion of Constantine, his victorious religion broke the violence of the fall, and mollified the ferocious temper of the conquerors. Gibbon knows that paganism was a cruel and absurd religion. A man might accept it from civic or ancestral duty. No one but a fool could choose it over Christianity. Julian the Apostate was one of the heroes of the eighteenth century. Gibbon joins in the applause – but always mingles admiration with contempt. See past its fanaticism, and Christianity was manifestly a better religion. It was a religion of equality in salvation. After centuries of despotism checked only by regicide, it gave the Roman Empire the basics of a mixed constitution. And, when the Western Empire began to collapse under the weight of its own corruption, the Church remained, to keep up the best of the old civilisation, and to convert and humanise the barbarians. I could pass to looking beyond his headline dislike of the Byzantine Greeks to a more subtle understanding of what they survived and what they achieved. But I will not. I have said enough. I will end this review with the hope that someone will read it who has not yet opened Gibbon, and who will now become acquainted with him. I wish that person bon voyage. I find the words “Christianity” and “racism” irritating. Neither is ever defined. “Christianity” can mean either a supernatural belief that Jesus Christ was some sort of God and we’ll all go to Hell if don’t worship him from dawn till dusk. Or it can refer to the practice of following Christ’s teachings without any thought for the supernatural, on the entirely rational basis that they make a lot of sense. Going off at a tangent, I don’t suppose “The policy of the emperors and the senate….was happily seconded…” could be a play on words? Juxtaposing ‘happily’ and ‘seconded’, from a more obscure meaning of ‘secundus’ as ‘happy’, or ‘favourable’? (It’s a seafaring term – if the ship goes first and the wind comes second, i.e. a following wind, it is happy or favourable). I’m probably away with the fairies on this, but it caught my eye.